With its simple lines and contemporary looks, the 3-door Shoe Cabinet would complement nicely any entrance hallway. But what’s great about it is the generous amount of shoe storage space within the three doors. Five tiers with four adjustable shelves to fit in dress shoes, sneakers, heels, boots, sandals and everything else in between. 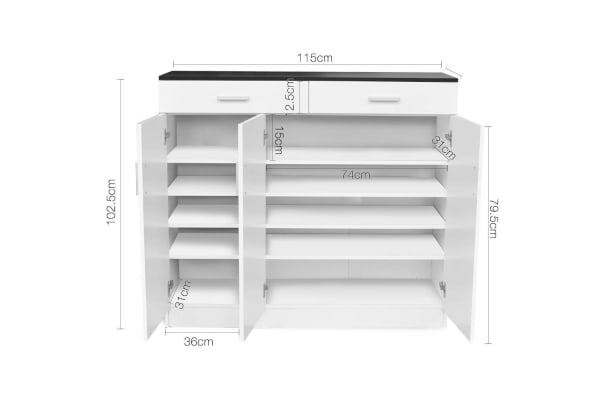 On top, two spacious drawers let you fill them up with footwear accessories or any other household essentials with ease. Two elegant handles complete the superb ensemble. 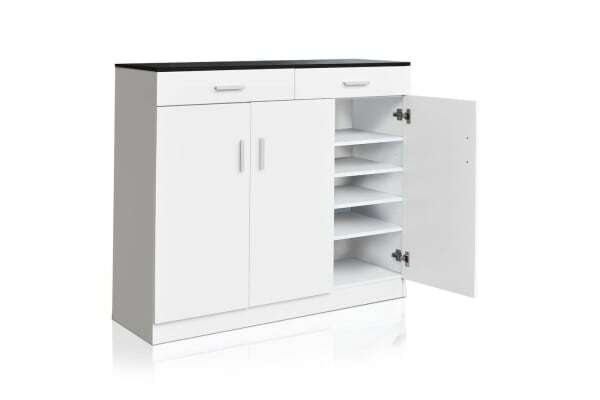 Made of durable particle board, the Shoe Cabinet is sturdy, practical and easy to clean and designed to match easily with any decor with its elegant black and white hues. So say goodbye to clutter and welcome to the neat and tidy world of our 3-door Shoe Cabinet.